Gibson decided to reintroduce the Explorer in 1976. After the initial, failed introduction in 1958, the model went on hiatus. 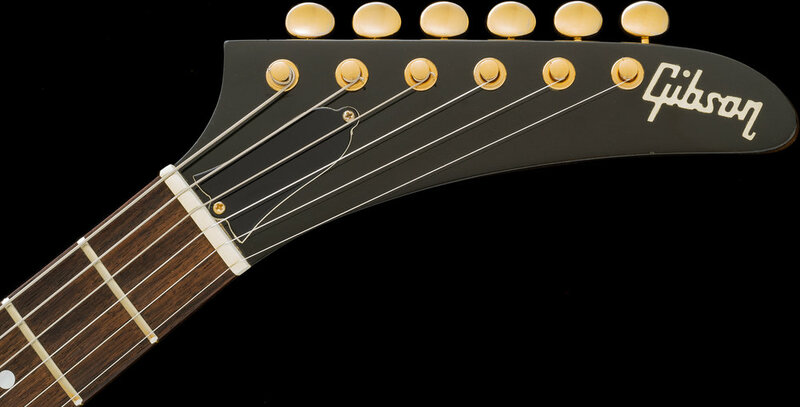 In the mid-1970s Gibson realized that other companies were successfully building their own Explorer shaped guitars and I can only assume they decided to join the fray. These early production 1st-year models were made as "Limited Editions," and the model was far more successful this second time. According to Gibson's shipping totals, 1,835 guitars were shipped and were originally offered in 3 finishes. It is not known how many Explorers were labeled as "LIMITED EDITION" as Gibson's shipping totals do not delineate between models. 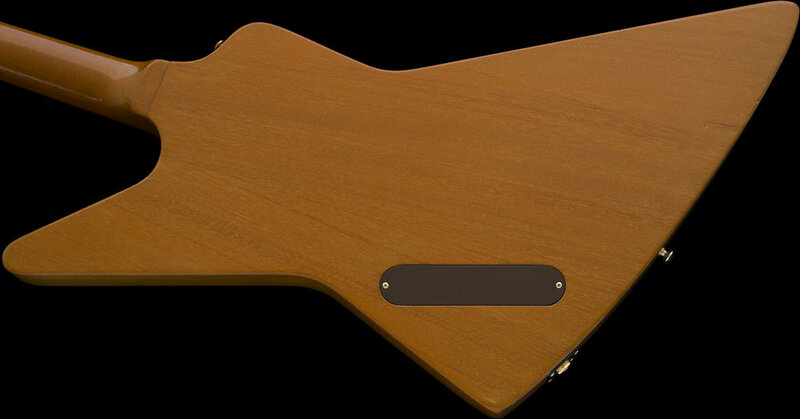 The earlier "LE" models tend to have a large feeling, chunky "C" shape neck, as this one does, and feature 1-piece mahogany neck construction. 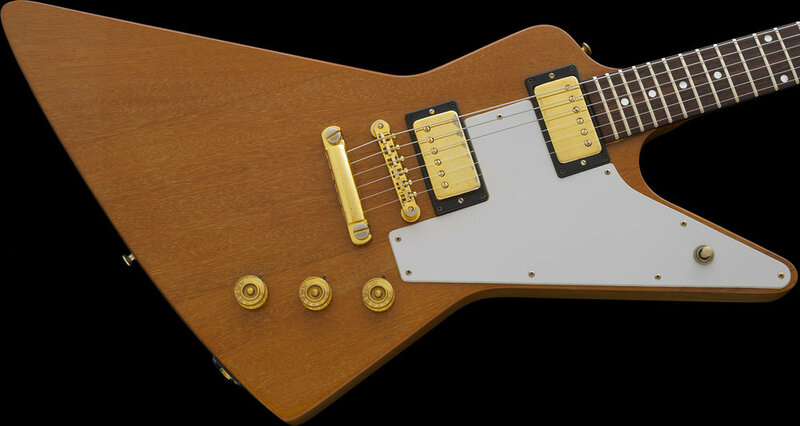 Like the 1976 period Bicentennial instruments that followed, Gibson continued the Explorer beyond 1976 as well as the Firebird 76 and Thunderbird 76 models, they built and sold them all up to and including 1979. I have examined, tested, serviced and set-up this instrument and found it to be factory-correct except for the NUT being changed prior to my acquisition of it. 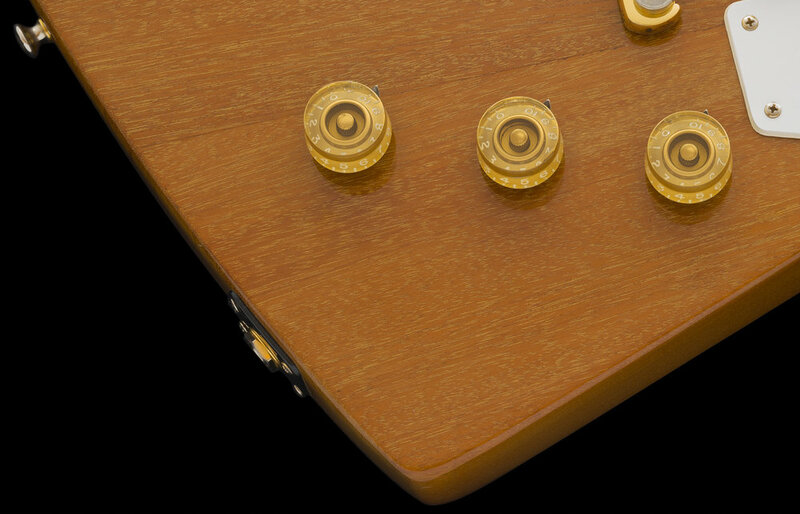 Otherwise, all of the electronics, frets, finish, tuners and both the plastic and gold-plated metal hardware are all correct and original to the guitar. All 3 of the potentiometers are original. The 2 Volume controls are matched and dated the 21st week of 1976, and the Tone control is dated the 15th week of 1976. This guitar is an extremely clean and collectible specimen. There is a factory "SECOND" stamp present on the back of the headstock. These stamps were generally applied when the factory discovered a cosmetic flaw or they wanted to sell an instrument at a "friend or family" discounted price. All these decades later, it would not be possible to know which scenario was the reason or find the cosmetic flaw, which was typically very minor and only cosmetic. The guitar looks to me to have been sparingly played for a short time, likely back when it was new. Globally, there are minor marks, chips, and dings into the finish, but it has seen very limited usage. Some of the gold platings exhibit minor wear too as my large and clear photographs show. I am rating the guitar a conservative "8.75 out of 10" in overall condition. The CASE is the factory-issued original Plush Lined hard shell and features a Black Tolex exterior with a soft magenta colored lining and is in excellent, matching condition with a fully functioning handle, latches, and hinges. The guitar has just been set up with a fresh set of D'addario XL 10 - 46 gauge strings. I acquired this beautiful, Limited Edition Explorer approximately 25 years ago. I was collecting original and reissue Flying V and Explorer guitars, and when this example landed in my lap, I decided to keep it. The guitar is now 42 years old and has been safely stored in my collection since purchasing it. As such, this one has been spared all of the "circulation" that most Vintage instruments being offered online today have undergone. Uncirculated examples of this caliber are very hard to come by all these years later. This guitar is in pristine, crisp condition and may appeal to other discerning modernistic guitar collectors, so please inquire. A page from the 1977 catalog. Even though Gibson released these models earlier, this is the 1st catalog these models appeared in.